CMDB is a technology. There is still disproportionate attention paid to the tools and geeky whiz-bangs and not enough to culture and process. CMDB is the wrong technology. It is nice to have a Configuration database of some form, but the most important technologies to Service Management are the Service Desk, the systems and network monitoring console, and SLA monitoring and reporting. Vendors argue these tools “need” a CMDB under them but remarkably most of them seem to work fine without one. CMDB can’t be done. I think my views on that are clear by now. As Siki Gunta put it, CMDB is a journey not a destination. (My old mate Graeme Fish at CA says “the first three times I remember to attribute it then it’s mine”). It is great that so many people are setting out on the journey, but I think all the interest comes because they are finding out it is HARD if you treat CMDB as a specification not an ideal. And don't get me started on SKMS. I did doubt my faith and asked people to prove me wrong about CMDB. I got one report of one CMDB, no info on the business ROI, and a great informal survey from itSMFUSA 2004. An informal survey on the blog showed only 15% of sites had something called "CMDB" after years of ITIL Version 2. I'm not wrong about CMDB. It is a geek fantasy. This relates to a big learning on the blog this month: how ITIL seems to have a bet each way - it wants to be proven and bleeding edge at the same time. From that comes the idea that CMDB is all about the journey not the destination. If Castle ITIL cared about the users, it'd broadcast this message REAL LOUD before the users all bloody themselves on the rocks of CMDB. The biggest event for the website this month was a vendor of digital IP stealing mine. The explanation was that contracted help had created the content and so no-one knew it was nicked. This might be a reason but it isn't an excuse. It was patently obvious it came from somewhere else and 30 seconds with Google would have shown where. Next time I'll publicly blame and shame, and I'll consider legal action. I loathe lawyers but I could use the money. The ITIL Establishment up at Castle ITIL (OGC, APMG, TSO, itSMFI) continue to demonstrate that they wouldn't know a user community if it stood up in their breakfast cereal. APMG "survey itSMF members" and 92% of my readers who are itSMF members don't know what they are talking about. OGC decide the collaborative IP-sharing ITIL Live Portal will be a paying product... when it finally appears. Someone needs to drag this lot kicking and screaming into the new millenium. This time next month I hope to be telling you about my new book. If you would like an advance peek, see the Real ITSM website. Best photo contributed by end of August wins a copy. 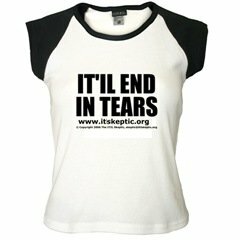 Send us your photo wearing an IT Skeptic T-shirt or cap, or waving an IT Skeptic coffee mug, and you can join the Rogues Gallery of IT Skeptics. Finally, I've been re-reading my biography of Antoni Gaudi after my friend Antonio gave me a statuette of one of the monsters from Park Güell. What a guy (both of them, but I'm referring here to Gaudi). Next time someone bangs on at you about a "new paradigm" or a "radical transformation" or other vendor crap, go look at Gaudi's work and see what a real new paradigm looks like. This month's pictures are from Gaudi's work. We have been discussing ITIL busines cases. In a previous post we talked about presenting any business case strategically. In this final post we apply that to ITIL. Why is Project Management almost invisible in ITIL V3? Why is Project Management all but invisible in ITIL V3? The IT Skeptic's poll on ISO20000 activity levels yielded some interesting results. Statistically invalid but interesting in a fun way. The world has forgotten the ITIL principle of "adopt and adapt". And ITIL suffers as a result. Happy Birthday ITIL V3, my how you have ... grown? The IT Skeptic asked a while ago about which books folk use most. I looked at my ITIL books and I can see I'm using ITIL V3 Service Transition and Service Operation most, based on the highly scientific metric of page markers and dog-ears. Sorry about the outages over the last 24 hours. WestHost has had a power problem. It is one hiccup in normally superb service. Wonder who their UPS manufacturer is eh? It occured to me today that defending your digital IP is like having a puppy [warning: yet another puppy analogy]. In previous posts we have been looking at ITIL business cases. The last one looked for the strong arguments for ITIL. There are some common weaknesses. The IT Skeptic adheres to a purist usage of the word "governance" which aligns closely with the new ISO38500 standard. The word is often used to mean management: running a business unit or function. This is just plain wrong. But somewhere in between is a set of activities in a grey area.